The Kiryby Sentria vacuum cleaner is specifically designed to work great on pet hair pick-up. With tubing twice the size of other brands, this vacuum offers no-clog, hassle-free operations. i recommend kirby. no complain. the best vacuum. i like all the tools ,you can use them all. I use to be a house keeper I try to use most of all the vacuum . every houses they have they own vacuum and i use that to clean their carpet. to compare the kirby to dyson, hoover, shark,bissel, miele, kenmore,electrolux, ore x. i still will choose the kirby. i know the kirby is heavy a little bit but it works wonderful for me. the life of the kirby is excellent , you can not brake it because this vacuum is all metal no plastic. you can use as a shampooer, it pick up any thing, has a strong suction. I like with the bag. the reason are when the bag is full , you can just throw the bag and put a new one. unlike with out the bag when you empty the container the dust everywhere and most of the time you need to pick some of the dirt or hair what ever it don't go down. so that is the reason i like the kirby because you don't get worry to get dirty your hands. you keep vacuum and no problem... kirby is the number for me. they say dyson is the best I don't think so . that is only my opion. they say shark is the best I don't think so too. shark has no floor hight adjustment. it should be light to use but it happen that when the carpet is high so when you push and pull its hard to do it. it hard to work. same thing to the dyson.i hope all of this opion it help you to choose kirby to buy or get. i am not a salesman i am just ordinary house keeper. 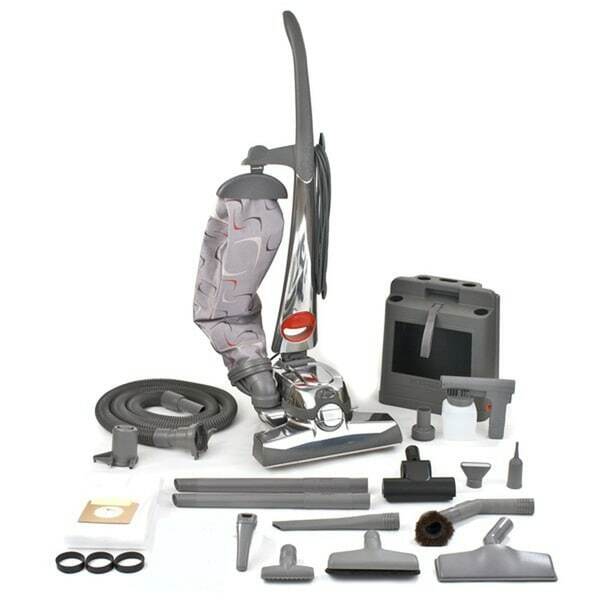 Kirby G10 Sentria Vacuum cleaners come in many shapes and sizes. My family owns a janitorial company; we have had many types of vacuum cleaners. The Kirby is one of the best we have ever owned. We have concluded that with its heavy steel frame it is virtually indestructible. They have a twelve amp motor which is almost double the average vacuum cleaner. They are much harder due to their thicker, two inch hoses. The Kirby is also a wet vacuum; in addition to this the Kirby has a life expectancy of around ten years, with little maintenance. This alone indicates that Kirby does not believe in planned albescence. The many attachments such as: floor kit, floor plate, bore bristle brush, turbo accessory kit; handy butler tool gives users a wide variety of ways to clean, from shampooing your carpet to dusting your drapes. Although the Kirby is expensive and it weighs around twenty five pounds, it worth it. Within the life expectancy of the Kirby many consumers will go through about eighteen to twenty two vacuums. The Kirby comes with a twelve foot hose that helps users reach hard spaces and it also comes in handy when you are cleaning the stairs. I would highly encourage everyone to purchase this masterpiece. The product description states the Kirby is "factory reconditioned". Documents shipped with the vacuum indicated that the Kirby was refurbished by a company called Great-Vacs, not Kirby. The description states a factory warranty, but the vacuum is not warranted by Kirby, but Great-Vacs. The vacuum had signs of being used, as well as a soiled /worn brush roll in the rug nozzle. I ended up returning this item and purchased a new Kirby from a authorized distributer ($1500). My folks had a Generation 3 they bought 20+ years ago that we finally threw out last year. I kick myself a bit for not discovering sooner that you can send the old ones back to the factory to be reconditioned for a few hundred dollars. Buying it here, I did not have to go through the door-to-door home-sale experience and the price is certainly less than most people claim to have paid buying them new. Just like the one my parents bought, this is mostly made of metal. These are big, solid, and expensive by comparison with other vacuum cleaners. Assembly took ~5 minutes with a screwdriver to tighten the hook that the power cord loops over and everything else snapped together. I read one review that suggested there are two versions of Sentria which are identical, except for the bag they use. The one I received uses the 'F' bags. I have someone come help clean house, so I use it occasionally - it did not receive the cat's seal of approval. :-) It sounds just like the old one and works well. Power assist makes the weight not an issue when on flat floors (versus the stairs). This came with all the same attachments as the one my folks had, except for the sander and floor shampooer. (It's not advertised as coming with these in the description). So far, it's running well - purchased the extended warranty and have not used that. If it's like the old one (and sure seems to be so far) I won't need to. I have been a "Kirby Man" forever. My mother owned a Kirby and for a time I sold Kirbys door to door. In my opinion there is no finer vacuum cleaner made. My wife bought 2 different vacuums from a different manufacturer and burned the motor up with both of them vacuuming the carpet of our apartment. She wanted to have on delivered to our home and so I went on the internet, and found the Kirby from Overstock. It was delivered on time and as a previous reviewer stated with about 12 bags and the metal was shiny. At first my wife thought it would be heavy to use, but I showed her how to change and use the attachments and how the machine "self propelled" itself. She was amazed at how easy it was to maneuver. When she finished, I asked her how was it and she said, "I love it". I think you will too. bought this never having a kirby before.very sturdy machine and built very well..bought it reconditioned and expected it to look reconditioned but it was in very good shape with no scratches or marks..i have bought many vacuum cleaners over the years but the kirby has been the best by far and very satisfied with it.have had it for several years now and works just as well as when i bought it. Sweeper works great just moved into a patio home after using Kirby rugs looked great . Kirby came. In excellent condition everyone who see it thought I bought a new one. Would highly recommend , buying you will not be disappointed . Thank you. We used to own a g six. That was nice. It was a bit loud, but it was expected. This g 10 hurts my ears. I bought one of these BRAND NEW. I hate it. I was caught in a moment of weakness when I bought it. It's heavy, noisy and bulky. All the attachments look cool and that's all I can say. I can find other, EASIER ways to do the things the attachments claim to do. Do yourself a favor and get a Dyson. I wish I had kept mine. Kirby and I go a long way back, and we come a long way forward. Could not live without this machine!!! Everything arrived as expected. There are at least a dozen vac bags when I expected only two. I had an issue with the finish on the handle. The reseller has responded quickly and is going to replace the blemished handle. GREAT Customer Service. And the vac runs flawlessly! I am one very happy customer. Saved at least $1000. off of the "New" price! My wife had an in home demonstration and loved the product, but did not like the high pressure sales pitch, guilt trip from the guy for spending 3 hours cleaning the house and not getting the sale immediately, or the $2000 price quote that got reduced to $1700 after the guy "talked to his boss". Direct sales are so sketchy, especially when the sales guy is commission only. I found this vacuum (one model cycle older) for way less and it came with free shipping. No brainer. "Does this vacuum have a carpet shampooer also?" Hello Diane, this includes a handheld shampooer. Thanks for shopping with us! A.S.
"How much does this model weigh?" Hello, tangerinedreams2. This weighs approximately 35 pounds. Thank you for shopping with us. "What is the model year"
Hello, kobe08094. This model was introduced in 2006. The product you receive will be between 2006 and 2012. Thank you for shopping with us. "Can a zip brush be attached to this model?" Hello, spooner100. Yes, a Zippbrush would work with this model. Thank you for shopping with us. "Review notes buying it from overstock results in NO warranty from Kirby, is that true." Thank you for shopping with us tictoc77. The motor has a 5 year warranty from the manufacturer. You can also purchase a 2 or 3 year protection plan from our company. Have a great day. "is this g10e or g10d"